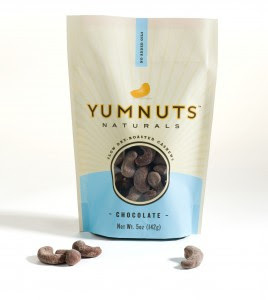 Just found a great new product: Yumnuts. Admittedly, I can't think about the name without thinking of the grade school insult "numb nuts"... but that's neither here nor there. Best part: they are marked gluten free and delicious! Of course I went straight for the chocolate flavor because I'm a chocolate fiend. I've had plenty of chocolate covered treats before -- I often buy the dark and milk chocolate covered almonds from Trader Joe's which are good, but Yumnuts are definitely better. The Trader Joe's nuts have a much thicker coating than Yumnuts and practically drown in chocolate -- not that so much chocolate is a bad thing, but Yumnuts taste a bit healthier and less like a treat. The company makes other flavors, including sea salt, spicy cajun, and honey, amongst others. i LOVE how many times you said yumnuts in this post and the mention of how much you love chocolate brought me back to the time you ate an 11 pound box of chocolate on the airplane on the way home from Holland. Chocolate fiend doesn't do you justice my little yumnut, you are a fanatic.